Topographical Irish Landscape Artist, 18th/19th Century, Biography and Paintings. County Kildare. By William Ashford. Born in Birmingham, William Ashford was an English artist who painted exclusively in Ireland, becoming - along with George Barret, Senior (1732-84) and Thomas Roberts (1748-1778) - one of the leading painters of the Irish landscape. His uncomplicated topographical compositions, complete with their well-ordered estates and parklands, were designed to satisfy the concerns of his landowning clientele and thus lacked the romance and atmosphere achieved by other leading Irish landscape artists. Ashford first came to Ireland in 1764, to take up a position in the Ordnance Office in Dublin. He began exhibiting a number of flower-paintings and still lifes of fruit and dead game, with the Society of Artists in William Street, progressing thereafter to classical landscapes until the Society disbanded in 1780. No art shows were staged in Dublin until 1800 when a new Irish Artists Society was formed, so meantime Ashford exhibited in London and rapidly established himself as one of the leading exponents of landscape painting in Ireland. Following disagreements between various artist groups in Dublin (1800-1812), Ashford was elected President of the newly formed Irish Society of Artists. Then, in 1823, after years of personal campaigning, he became a founding member of the first national artist body - the Royal Hibernian Academy, which elected him their first President. He, together with William Cuming and Thomas Sautelle Roberts, were given the task of selecting 14 academicians and 10 associates. Sadly, he died the following year, aged 78. As a landscape painter, Ashford favoured idyllic, topographical views - largely of peaceful, neat farmlands, parks and grounds of country estates, or rivers and valleys. He rarely attempted the dramatic style landscapes favoured by other Irish artists of the day. Later in life he extended his range to include a number of coastal sea-views. 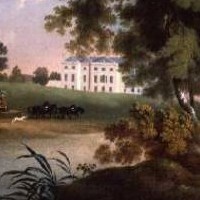 Although largely untrained, his imaginary vistas proved exceptionally popular with his land-owning patrons like Lord Fitzwilliam, and he became one of the most successful Irish artists of the 18th century and early 19th century.  For the evolution of Irish landscapes, see History of Irish Art.  For more information about Irish painters, see: Homepage.